Durban — THE first sight I noticed after pulling back my hotel curtains yesterday morning was a band of cleaners combing through most streets of Nelspruit. The reason was simple. They were gathering up all evidence of celebrations sparked by Ethiopia's historic 1-1 draw against African champions Zambia the previous night. 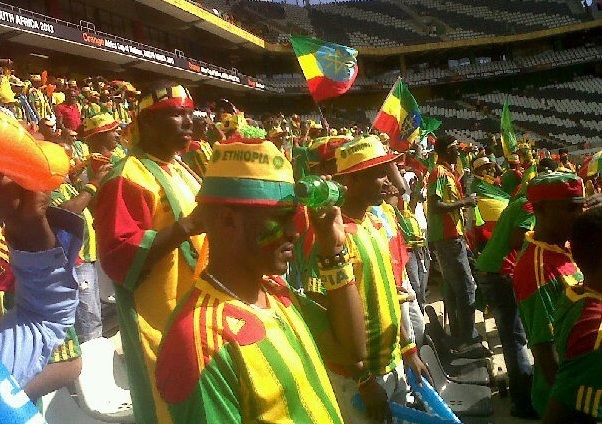 The approximately 13,000 Ethiopian fans here are clearly enjoying the Orange Nations Cup party more than anyone and last night all streets through Nelspruit were not only flooded with celebrating fans in a night-long fiesta but also paper plates, bottles and discarded paraphernalia. There was one interesting sight outside the Mbombela Stadium when over-excited fans hijacked a mini bus and forced the driver to hand over his keys. They then danced on the roof of the bus as it careered through the city. In the surrounding bars, many carried on drinking and enjoying themselves into the night. But then you have to understand why. The Ethiopians came to the Orange finals as underdogs. They were considered the weakest in a group that also includes Nigeria and Burkina Faso. And yet from the evidence of their display against the Chipolopolo, there is enough to suggest they could squeeze through the last eight. It took a ten-man side just 90 minutes to win over everyone's heart here including a majority of the disgruntled South Africans, who have no faith in the Bafana Bafana. There was a standing ovation for the Ethiopians at the end that brought tears to the eye. Given that they are relative beginners in the competition, and given that their passion obviously strikes a chord with me, I have decided to join them too. On Friday, East Africa's sole representatives will confront Burkina Faso with the same suffocating possession football that fans are relating to the tiki-taka of Barcelona. One of Ethiopia's most fundamental aspects of play is their calm, methodical approach to build-up play. They move the ball around the pitch, change angles of attack before working the ball into the space just outside the 18-yard box. Gaps then develop as impetuous defenders attempt to close down their two strikers Ahmed Salahdin Said and captain Gebreyes Adane. Their holding midfielder Gobena Asrat, centre backs Reda Aynalem/Zewg Elyas and even goalkeeper Bushura Jemal can dribble out of tights spots, enabling the team to stick to their build-up play principles. Burkina Faso and Nigeria be very afraid!